Plast Reconstr Surg. 2009 Apr;123(4):1265-75. doi: 10.1097/PRS.0b013e31819e6529. Gynecol Oncol. 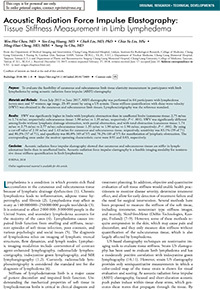 2012 Jul;126(1):93-8. doi: 10.1016/j.ygyno.2012.04.017. Epub 2012 Apr 17. 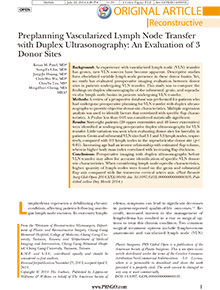 Preplanning Vascularized Lymph Node Transfer with Duplex Ultrasonography: An Evaluation of 3 Donor Sites. Patel KM, Chu SY, Huang JJ, Wu CW, Lin CY, Cheng MH. Plast Reconstr Surg Glob Open. 2014 Sep 8;2(8):e193. doi: 10.1097/GOX.0000000000000105. eCollection 2014 Aug.
Dayan JH, Dayan E, Kagen A, Cheng MH, Sultan M, Samson W, Smith ML. J Reconstr Microsurg. 2014 Jan;30(1):41-5. doi: 10.1055/s-0033-1351668. Epub 2013 Sep 9. 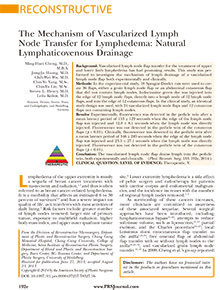 The mechanism of vascularized lymph node transfer for lymphedema: natural lymphaticovenous drainage. Cheng MH, Huang JJ, Wu CW, Yang CY, Lin CY, Henry SL, Kolios L.
Plast Reconstr Surg. 2014 Feb;133(2):192e-8e. doi: 10.1097/01.prs.0000437257.78327.5b. 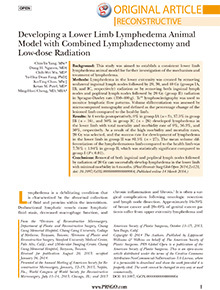 Developing a Lower Limb Lymphedema Animal Model with Combined Lymphadenectomy and Low-dose Radiation. Yang CY, Nguyen DH, Wu CW, Fang YH, Chao KT, Patel KM, Cheng MH. Plast Reconstr Surg Glob Open. 2014 Apr 7;2(3):e121. doi: 10.1097/GOX.0000000000000064.eCollection 2014 Mar. Plast Reconstr Surg Glob Open. 2014 Jul 9;2(6):e167. doi: 10.1097/GOX.0000000000000099. eCollection 2014 Jun. 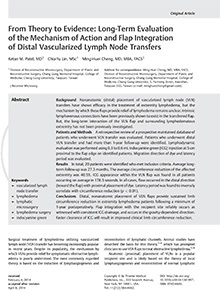 From theory to evidence: long-term evaluation of the mechanism of action and flap integration of distal vascularized lymph node transfers. Patel KM, Lin CY, Cheng MH. J Reconstr Microsurg. 2015 Jan;31(1):26-30. doi: 10.1055/s-0034-1381957. Epub 2014 Aug 19. 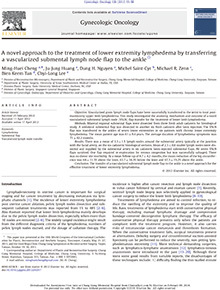 Quantity of lymph nodes correlates with improvement in lymphatic drainage in treatment of hind limb lymphedema with lymph node flap transfer in rats. Nguyen DH, Chou PY, Hsieh YH, Momeni A, Fang YH, Patel KM, Yang CY, Cheng MH. Microsurgery. 2016 Mar;36(3):239-45. doi: 10.1002/micr.22388. Epub 2015 Feb 25. 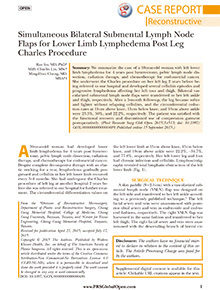 Simultaneous Bilateral Submental Lymph Node Flaps for Lower Limb Lymphedema Post Leg Charles Procedure. Ito R, Lin MC, Cheng MH. Plast Reconstr Surg Glob Open. 2015 Sep 15;3(9):e513. doi: 10.1097/GOX.0000000000000489. eCollection 2015 Sep.
Microsurgery. 2016 May;36(4):310-5. doi: 10.1002/micr.30010. Epub 2015 Dec 15. Lymphedema surgery: Patient selection and an overview of surgical techniques. Allen RJ Jr, Cheng MH. J Surg Oncol. 2016 Jun;113(8):923-31. doi: 10.1002/jso.24170. Epub 2016 Feb 5. Review. 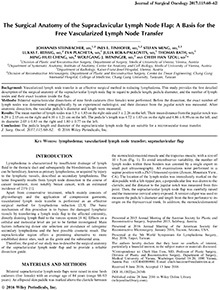 Surgical anatomy of the vascularized submental lymph node flap: Anatomic study of correlation of submental artery perforators and quantity of submental lymph node. Tzou CH, Meng S, Ines T, Reissig L, Pichler U, Steinbacher J, Pona I, Roka-Palkovits J, Rath T, Weninger WJ, Cheng MH. J Surg Oncol. 2017 Jan;115(1):54-59. doi: 10.1002/jso.24336. Epub 2016 Jun 23. 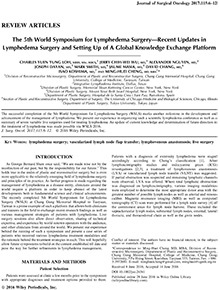 The 5th world symposium for lymphedema surgery-Recent updates in lymphedema surgery and setting up of a global knowledge exchange platform. Loh CY, Wu JC, Nguyen A, Dayan J, Smith M, Masia J, Chang D, Koshima I, Cheng MH. J Surg Oncol. 2017 Jan;115(1):6-12. doi: 10.1002/jso.24341. Epub 2016 Jun 28. Review. 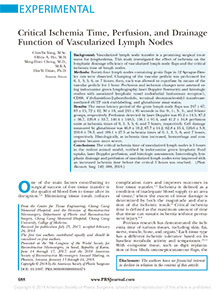 The surgical anatomy of the supraclavicular lymph node flap: A basis for the free vascularized lymph node transfer. Steinbacher J, Tinhofer IE, Meng S, Reissig LF, Placheta E, Roka-Palkovits J, Rath T, Cheng MH, Weninger WJ, Tzou CH. J Surg Oncol. 2017 Jan;115(1):60-62. doi: 10.1002/jso.24346. Epub 2016 Jun 28. 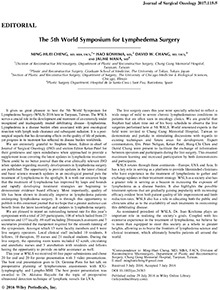 The 5th World Symposium for Lymphedema Surgery. Cheng MH, Koshima I, Chang DW, Masia J.
J Surg Oncol. 2017 Jan;115(1):5. doi: 10.1002/jso.24383. Epub 2016 Jul 29. No abstract available. 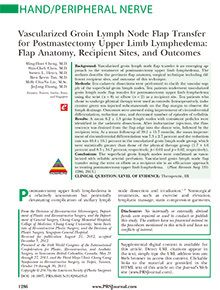 Platysma-sparing vascularized submental lymph node flap transfer for extremity lymphedema. Poccia I, Lin CY, Cheng MH. J Surg Oncol. 2017 Jan;115(1):48-53. doi: 10.1002/jso.24350. Epub 2017 Jan 6. 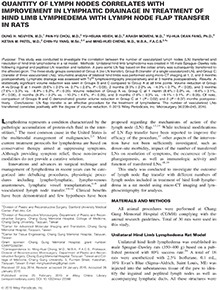 A prospective clinical assessment of anatomic variability of the submental vascularized lymph node flap. Cheng MH, Lin CY, Patel KM. J Surg Oncol. 2017 Jan;115(1):43-47. doi: 10.1002/jso.24487. Epub 2017 Jan 13. Plast Reconstr Surg Glob Open. 2017 Apr 25;5(4):e1288. doi: 10.1097/GOX.0000000000001288. eCollection 2017 Apr. 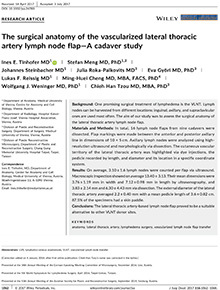 The surgical anatomy of the vascularized lateral thoracic artery lymph node flap-A cadaver study. Tinhofer IE, Meng S, Steinbacher J, Roka-Palkovits J, Györi E, Reissig LF, Cheng MH, Weninger WJ, Tzou CH. J Surg Oncol. 2017 Dec;116(8):1062-1068. doi: 10.1002/jso.24783. Epub 2017 Aug 7. 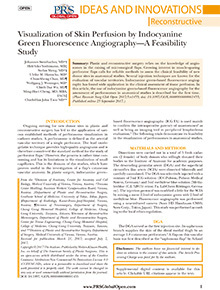 Visualization of Skin Perfusion by Indocyanine Green Fluorescence Angiography-A Feasibility Study. Steinbacher J, Yoshimatsu H, Meng S, Hamscha UM, Chan CS, Weninger WJ, Wu CT, Cheng MH, Tzou CH. Plast Reconstr Surg Glob Open. 2017 Sep 25;5(9):e1455. doi: 10.1097/GOX.0000000000001455. 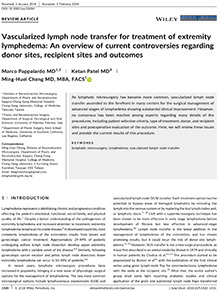 eCollection 2017 Sep.
Vascularized lymph node transfer for treatment of extremity lymphedema: An overview of current controversies regarding donor sites, recipient sites and outcomes. Pappalardo M, Patel K, Cheng MH. J Surg Oncol. 2018 Jun;117(7):1420-1431. doi: 10.1002/jso.25034. Epub 2018 Mar 24. Review. 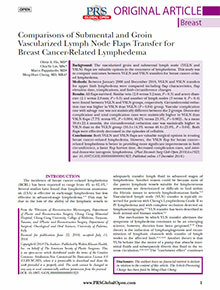 Vascularized Lymph Node Transfer for Lymphedema. Schaverien MV, Badash I, Patel KM, Selber JC, Cheng MH. Semin Plast Surg. 2018 Feb;32(1):28-35. doi: 10.1055/s-0038-1632401. Epub 2018 Apr 9.Review. 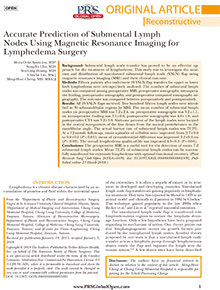 Accurate Prediction of Submental Lymph Nodes Using Magnetic Resonance Imaging for Lymphedema Surgery. Asuncion MO, Chu SY, Huang YL, Lin CY, Cheng MH. Plast Reconstr Surg Glob Open. 2018 Mar 23;6(3):e1691. doi: 10.1097/GOX.0000000000001691. eCollection 2018 Mar. 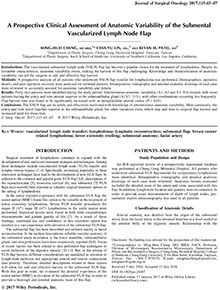 Critical Ischemia Time, Perfusion and Drainage Function of Vascularized Lymph Nodes. Yang CY, Ho OA, Cheng MH, Hsiao HY. 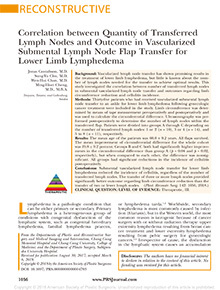 Correlation between Quantity of Transferred Lymph Nodes and Outcome in Vascularized Submental Lymph Node Flap Transfer for Lower Limb Lymphedema. Gustafsson J, Chu SY, Chan WH, Cheng MH. Acoustic Radiation Force Impulse Elastography: Tissue Stiffness Measurement in Limb Lymphedema. Chan WH, Huang YL, Lin C, Lin CY, Cheng MH, Chu SY. 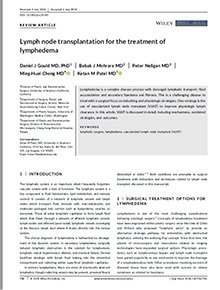 Lymph node transplantation for the treatment of lymphedema. Gould DJ, Mehrara BJ, Neligan P, Cheng MH, Patel KM. J Surg Oncol. 2018 Aug 21. doi: 10.1002/jso.25180. [Epub ahead of print] Review. Ho, Olivia, Chu Sung-Yu, Huang Yen-Ling, Chen Wen-Hui, Lin Chia-Yu, Cheng Ming-Huei. 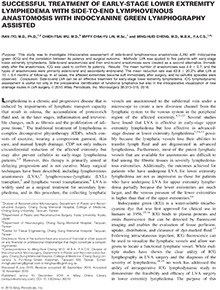 Outcomes of Vascularized Lymph Node Transfer and Lymphovenous Anastomosis for Treatmentof Primary Lymphedema. Cheng MH, Loh CYY, Lin CY. Plats Reconstr Surg Glob Open. 2018 Dec 20;6(12):e2056. 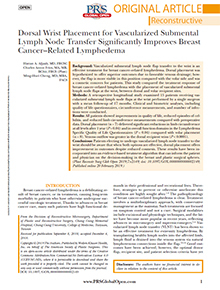 Comparisons of Submental and Groin Vascularized Lymph Node Flaps Transfer for BreastCancer-Related Lymphedema. Ho OA, Lin CY, Pappalardo M, Cheng MH. Plats Reconstr Surg Glob Open. 2018 Dec 13;6(12):e1923. 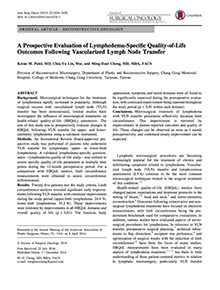 A Prospective Evaluation of Lymphedema-Specific Quality-of-Life Outcomes Following Vascularized Lymph Node Transfer. Ann Surg Oncol. 2015 Jul;22(7):2424-30. doi: 10.1245/s10434-014-4276-3. Epub 2014 Dec 17. 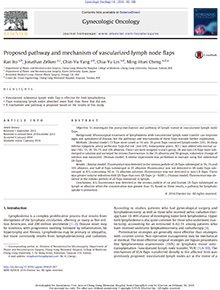 Proposed pathway and mechanism of vascularized lymph node flaps. Ito R, Zelken J, Yang CY, Lin CY, Cheng MH. Gynecol Oncol. 2016 Apr;141(1):182-8. doi: 10.1016/j.ygyno.2016.01.007. Epub 2016 Jan 7. 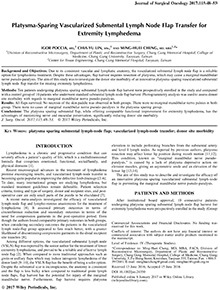 Validity of the Novel Taiwan Lymphoscintigraphy Staging and Correlation of Cheng LymphedemaGrading for Unilateral Extremity Lymphedema. Cheng MH, Pappalardo M, Lin C, Kuo CF, Lin CY, Chung KC. Ann Surg. 2018 Sep;268(3):513-525. doi: 10.1097/SLA.0000000000002917. 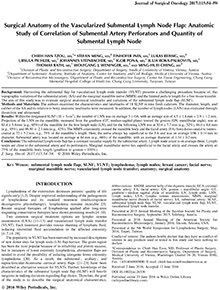 Dorsal Wrist Placement for Vascularized Submental Lymph Node Transfer Significantly Improves Breast Cancer–Related Lymphedema. Hattan A, Fries Charles Anton, BChir, FRCS, Cheng Ming-Huei. Plastic and Reconstructive Surgery – Global Open: 2019 Feb, 7(2): e2149. 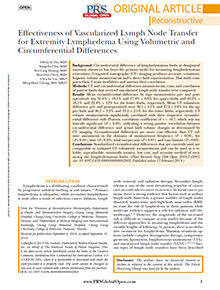 Principles and Practice of Lymphedema Surgery. Cheng MH, Chang DW, Patel KM (Editors). Elsevier Inc, Oxford, United Kingdom. Cheng MH, Nguyen DH, Huang JJ. 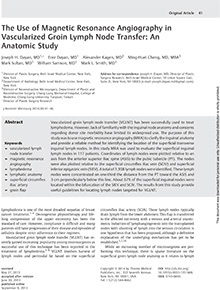 Chapter 77: Vascularized Groin Lymph Node Flap for Treatment of Lymphedema. In: Perforator Flaps: Anatomy, Technique, & Clinical Applications. 2nd Edition. Blondeel PN, Morris SF, Hallock GG, and Neligan PC (Editors). Quality Medical Publishing, Inc. St. Louis, Missouri. 2013:1317-1328. Cheng MH, Nguyen DH. 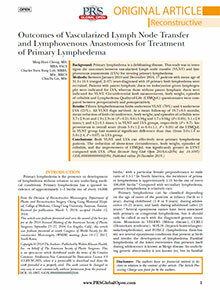 Chapter 54: Lymph Node Transfer for Lymphedema. In: Operative Microsurgery. Boyd JB and Jones NF (Editors). McGraw-Hill, New York. 2015:672-682. Tobbia D, Cheng MH. 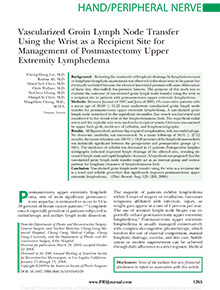 Vascularized Groin Lymph Node Flap Transfer for Post mastectomy Upper Limb Lymphedema. In Grabb’s Encyclopedia of Flaps, 4th edition. Strauch B, Vasconez LO, Lee BT, and Herman CK (Editors). Wolters Kluwer, Philadelphia, PA, USA. 2015. Tzou CHJ, Cheng MH. Transfer of lymph node tissue – my approach. In Oncoplastic and Reconstructive Management of the Breast: A Multidisciplinary Approach. CRC Press, Boca Raton, FL, 2015. Cheng MH, Patel KM. 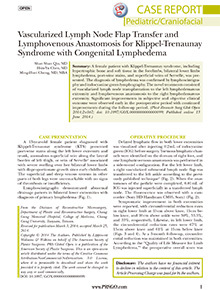 Chapter 16: Microsurgical procedures: vascularized lymph node transfer from the submental region. 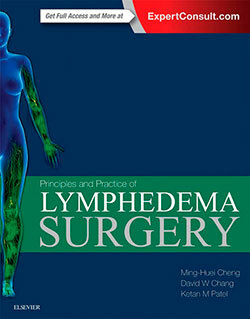 In Principles and Practice of Lymphedema Surgery. Cheng MH, Chang DW, Patel KM (Editors). Elsevier Inc, Oxford, United Kingdom. 2015. Constantinescu T, Huang JJ, Cheng MH. Chapter 22: Tracking outcomes following lymphedema treatment. In Principles and Practice of Lymphedema Surgery. Cheng MH, Chang DW, Patel KM (Editors). Elsevier Inc, Oxford, United Kingdom. 2015. Cheng MH, Chang DW, Patel KM. Chapter 24: Future perspectives in lymphatic microsurgery. In Principles and Practice of Lymphedema Surgery. Cheng MH, Chang DW, Patel KM (Editors). Elsevier Inc, Oxford, United Kingdom. 2015. Ito R, Cheng MH. 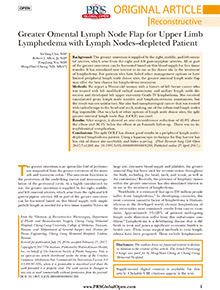 Managing upper limb lymphedema with lymph node transfer. In Oncologic Breast Reconstruction. Peirong Yu (Editor). People’s Medical Publishing House in China. In press. Huang JJ, Cheng MH. 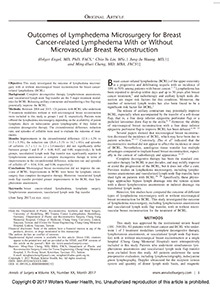 Lymphedema microsurgery for breast cancer related upper limb lymphedema. In Operative Techniques in Plastic Surgery. Chung K, Thorne C, Gosain A, Soltanian H, Aalst J, Mehrara B, Disa J, and Lee G (Editors). Wolters Kluwer. Netherland. In press. Oluseyi Aliu, Jill P. Stone, Ming-Huei Cheng. 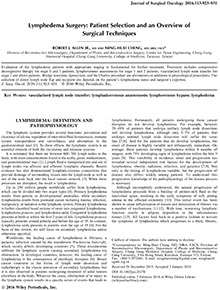 LYMPHEDEMA: DIAGNOSIS AND TREATMEN. In Grabb and Smith.